For over 50 years, St. Anne Home has been committed to offering superior health care services to the senior members of our community. As a faith-based facility, we are focused on providing spiritual, social, and emotional support in addition to the level of care that is specific to our residents’ individual needs. 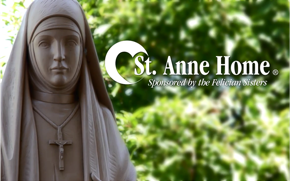 St. Anne Home is a ministry of the Felician Sisters of North America dedicated to the continued healing mission of Jesus Christ by providing a continuum of care and supportive services to adults, their families, and their caregivers. St. Anne Home offers intermediate and skilled nursing care, while Villa Angela at St. Anne Home provides personal care services in a caring, residential setting.